I am taking a little break from dies today to honor my best friend who passed away eighteen months ago today. Susan was a crazy-fun and faithful friend. She took a part of me with her. And I'm ok with that. But the part of me she left behind is stronger because while I never thought I could survive this loss - I did. 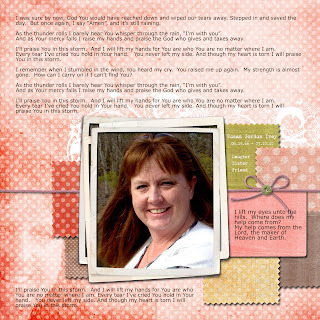 So this is a digital layout of my friend Susan. The background words are from "Praise You In This Storm" which is the song that played during the slideshow at her memorial service. I was honored to be able to speak at her service. If you would like to know what I said, you can read it here. Susan would be proud of me (she always was). She was my biggest supporter. She believed I could do anything. She would have liked this website. I love that about her. I will be back tomorrow with another project using dies...but today I just want to remember my Susan and share her with you. You would have loved her too. Not a doubt in my mind...you would have loved her.